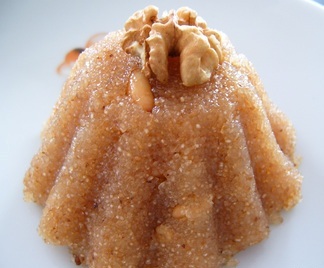 If you want to try this halva recipe at home, you have to know that it’s very easy to be prepared, so you need not much time and you will have a tasty dessert. Melt butter in sauce pan. Add Farina, sautee slowly on low heat for 15 to 20 minutes. At the same time, heat water, bay leaf, saffron, vanilla and milk. When grains are sandy, add the hot liquid with the maple syrup and turn up the heat. Cook until thick bubbles spurt. Transfer onto a cookie sheet. Swirl in raspberry sauce or jam. Let cool 5 minutes, cut and serve. For Vegans: Substitute soy margarine for butter and use more water instead of milk. *Serving ideas : This dish may be formed in any shape when you pour. You can surprise your guests with such a dessert, especially if you give it a nice form and decoration. Kids will love it!